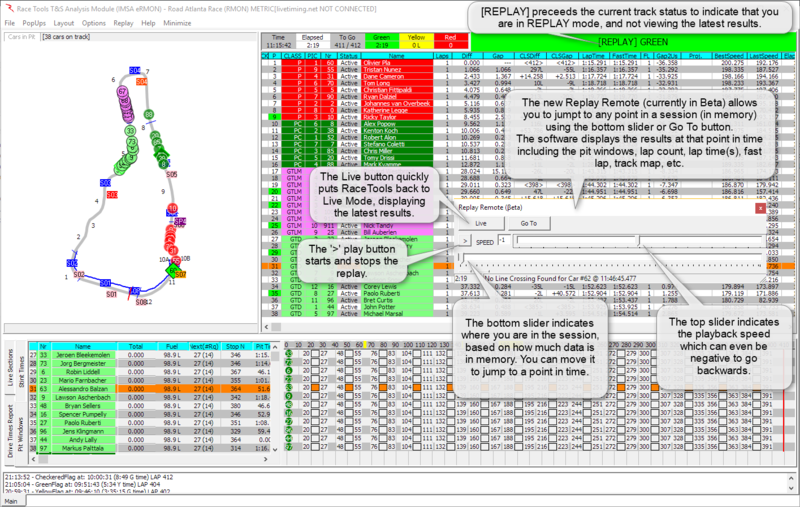 The ability to replay a session in RaceTools has been part of the software since the very first version. It was a good tool for me to use to develop and debug the software and a great tool for teams to analyze data from previous sessions, events or even years. Using replay files rather than CSVs or other event data files, you could ‘relive’ a session in real time or even faster than real time, to truly understand not just the data, but the context of the data as a session evolved. This is a useful tool and teams use it to prepare for upcoming events, practice using RaceTools and do post session analysis with a clean dataset. With the custom playback speed, you can quickly fast forward to a point in the session you wanted to review. With the Play Until feature you can let the replay run while you did something else and have it stop at a designed point, whether it was a Time Of Day, Elapsed Time, Lap Number or Flag Change. These are great tools, but we wanted more. What was wanted and missing was the ability to go backwards, to quickly jump to a point in time, whether forwards or backwards to review a section of the session. With RaceTools v3, work has begun on the Replay Remote feature. Currently in beta, this interface will allow you to pause, rewind or jump ahead to any point in time that the software has in memory. 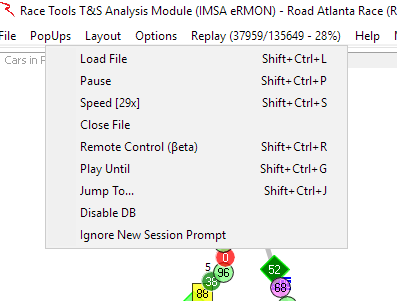 You can load the session into memory using the traditional replay feature, or load a previously saved session using the Load Session feature. Once a session is in memory, you can use the slider to go to a point in time and then hit the play button to play back the session either forwards or backwards. Jumping to point in time takes less than a second, so you can quickly find the point in the session you are looking for. You can use the Jump To button to go to a specific elapsed time. Note that the Replay Remote is still a beta feature so please use it with caution. The previous Relay option still exists and is useful even with the new Replay Remote feature as a way to get data into the system. You can only use Replay Remote on session data in memory, so you may need to replay a session into memory first before you can take advantage of the new features.